This entry was posted in Comments about Cycling on November 27, 2013 by Steve Tilford. I’m moving slow this morning, a little behind, not feeling all that well. 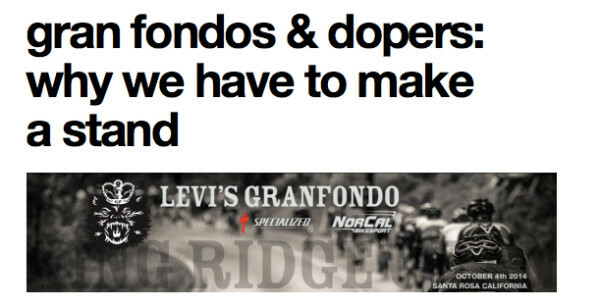 So, maybe you can use “my” time to go here and read Crankpunk’s rant about Levi’s Grand Fondo. It is a good read. He writes it much better than I could. I’m been meaning to write something very similar. I’ve sort of addressed it a few times with Christian Van de Velde’s $10000 Rancho Santa Fe getaway camp. Or you can read a little more about the Rich Meeker’s arbitration decision. This is a cliff notes synopsis, but there is a link to the actual USADA decision in the post. I’ll figure something out to write about later. The link regarding Rich Meeker’s arbitration decision is a MUST READ. What a shitheel. Get your ego and self esteem in order, man. seems like 90% of your recents posts have been about doping. you have any inside info on balan? hear anything from your gal friend? every year they are SUPOSE to get strict with riders that dope and the people in charge are all saying riders are clean… then at the end of every year, dozens more are caught.. the worst rider on the team, and the best rider on the team.. they all get caught.. they been saying they are cleaning up cycling and still tons of riders get busted..sad for cycling.. sad!! any scoop on balan? cheers for the link Steve, appreciated!